[Editor's note: Once more I am happy to turn this blog over again to the wonderful wire work of Paul Bishop. This is Paul's third tutorial: please don't miss the rest of them this month! 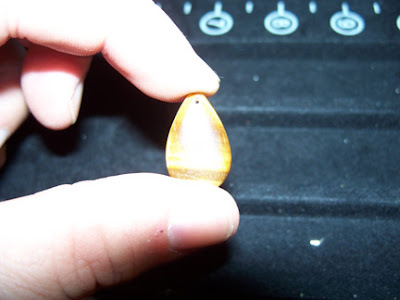 This tiger-eye pendant is smaller than my thumbnail. It’s about 3/4 inch wide and 1 inch tall. The hole for the wire is quite small, so I used a higher gauge wire (24?). The wire should have a snug fit in the hole. 1. Start a spiral by using your round-nose pliers to hold a wire at the very tip. 2. Wrap the wire tightly around one of the round-nose all the way back to the beginning. 3. Slip the wire into a pair of chain-nose or nylon pliers so the loop is in the jaws with the wire on the side of the loop nearest to you. It should be sticking out horizontally across your body toward your free hand (think very thin candy cane). 4. With your free hand, push the wire toward the spiral, keeping it in line with the spiral edge. The closer you do, the tighter your loop. We want this loop fairly tight. 5. Open the pliers and move the entire wire and loop so that the wire is back in place across your body. 6. Repeat these last two steps, checking against the pendant every few turns until you have a spiral that fits nicely on the pendant. One that is an equal distance away from the bottom and side edges is good. 7. Hold the spiral in your pliers, and using another set of pliers or your hands bend the wire 90 degrees so the spiral looks like a lollipop. 8. 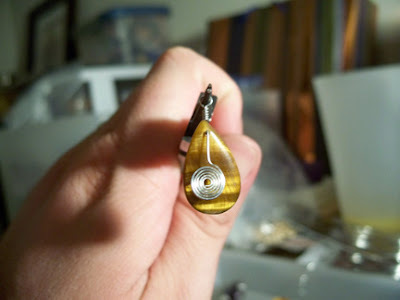 Turn the spiral over and place it on the pendant so the spiral is in place and the wire points up toward the hole. You want 2” or more above the hole, to make the wrapped loop coming up. 9. 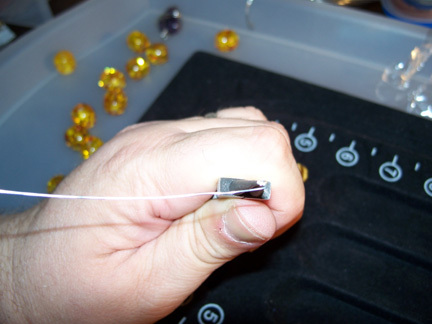 Mark the wire lightly at the hole with a fine-point marker, taking care not to mark the pendant. 10. Keeping the spiral facing away, bend the wire 90 degrees at the sharpie mark. 11. Turn over the spiral and slide the wire through the hole in the front of the pendant. 12. 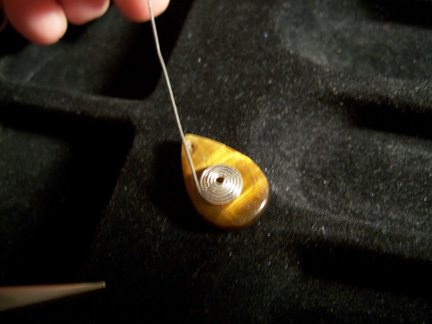 Holding the spiral in place on the pendant, bend the wire sticking out the back upward 90 degrees. If your wire is fairly snug in the hole, the pendant will stay in place easily and not slide over the bends. 1. Place the tip of your round-nosed pliers about ¼ inch above the bend, and bend the wire 90 degrees. 2. Move the pliers so one round-nose in the new bend and the other on top. How large the loop is depends on how deeply you place your pliers. 3. Bend the wire up and around and down the other side. 4. Move the pliers again so that the bottom part is in the loop. 5. Take the end of the wire (using another pair of pliers gives more fine control) and wrap it around the wire right at the bottom of the loop as tightly as you can. 6. Keep doing this as tightly as possible without overlap (like a coil) until you either reach ¼ inch from the wire end, of the bottom of the vertical wire. 7. Gently press your loops together with the chain-nose pliers. 8. Use your side cutters to snip off the excess wrapping wire (if any), then your chain nose pliers to push the remaining end again the bottom of the wrap under the last coil. Now, it’s either a pendant for its own cord/chain, or it can be a component in a larger wire necklace. If you are adventurous, 90 degree bends can be used to make diamonds, squares, rectangle shapes in a looser “spiral” form, whatever can fit your shape best. In the necklace picture, I used a similar treatment on a pendant, but used a plain loop at the top. The rest of the necklace is simple components – a few tiger-eye beads on a wire with a plain loop at either end. These were connected together by opening and closing loops. In this necklace, the wire is 20G Argentium sterling silver. I practiced making a lot of plain loops on stainless steel wire first until I could make them consistently! You could also make a necklace like this with wrapped loops, and joining the components with jump rings. The beauty of using components like this is that you can easily add or remove components to change the length. Copyright 2010 Paul Bishop. Not to be reprinted, resold, or redistributed for profit without the permission of the author. 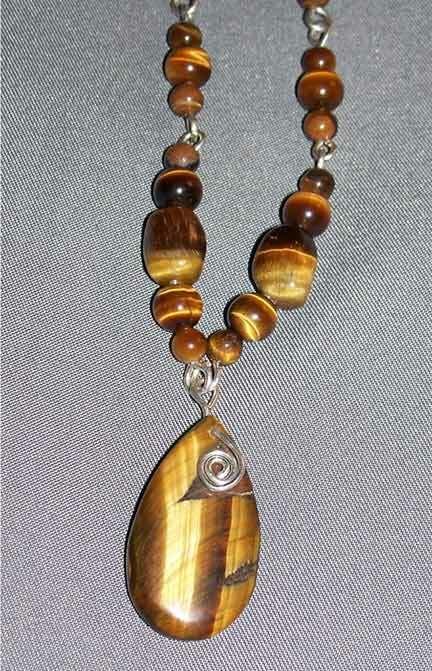 Nice color and the tiger eye piece nicely incorporated with the little metal piece.Very helpful tutorial.